We All See the Stars Inspired a program, "singing Equality across America and around the World." World Unity Inc. sponsored a national songwriting contest inviting singer songwriters across the nation to turn the Sun poem into a song. 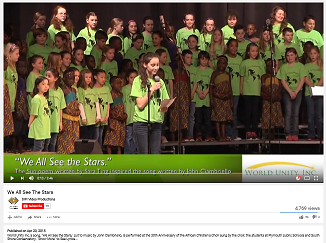 The winning song, "We All See the Stars," by John Ciambriello, was performed at the 30th Anniversary of the African Children's Choir sung by the choir, the students at Plymouth public Schools and South Shore Conservatory in April 2015. Five months later song was performed at the United Nations, September 26, 2015. Now it has inspired the program, “Singing Equality across America and around the World.” More than 62 school districts across the nation have signed on to share the song with their teachers. Call to Action – “Singing Equality across America and around the World,” is an ongoing initiative. Please help us plant this song of equality in America and the world. Share it with your community and please consider making a donation. We all See the Stars continues to inspire schools across the nation – Performance by Highland Goffes Fall School in New Hampshire. Be wowed by 429 children singing the song in sign language! 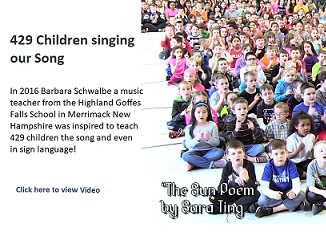 In 2016 Barbara Schwalbe a music teacher from the Highland Goffes Falls School in Merrimack New Hampshire was inspired to teach the entire school of 429 children the song and have them even perform it in sign language! This video has inspired other schools to teach their students and organizations to share it on their Facebook page! One school in New Haven Connecticut will have 1,000 children performing the song in a spring concert in May! World Unity, Inc.'s Public Service Announcement 30 seconds. 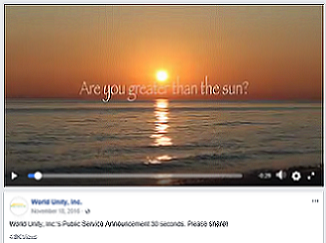 World Unity, Inc.’s PSA campaign for TV and radio is on-going We have a message that’s timeless and universal. It helps us see our common humanity – we are all human beings first. We continue to share our message with media outlets, and organizations through social media! Call to Action – Please plant this message in your organization and community and help create a nation and world that values all people. Please consider making a donation. 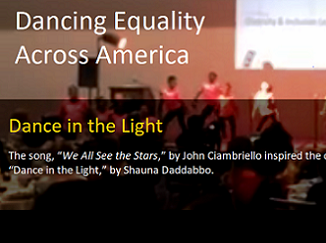 We all see the Stars by John Ciambriello inspired the creation of, “Dance in the Light,” by Shauna Daddabbo. She’s the founder of DivasMentoringdivas and performed the dance for the first time at World Unity Inc.’s 21st Annual Diversity and Inclusion Leadership Gala. Ken Barasa on Sara Ting's The sun Poem as done in Kenya, Africa. 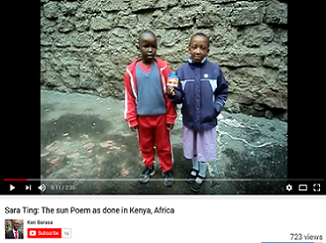 We’ve inspired a young man from Nairobi Kenya who is sharing our poem in Nairobi Kenya and has a dream to share it with the continent of Africa. Click on the picture above to see the video. The video is less than 3 minutes long. World Unity Inc. is no longer considering Children’s Wharf Park as a site for the World Unity Landmark. We have found a home at Union Point, Smart City.